Your 8th wedding anniversary gift on the modern list is celebrated by linen. There are a number of different gift ideas that come with linen that can make your wedding anniversary a day to remember. The first thing you think of when you think linen is bed linens and of course, bed linens are a great choice for the 8th anniversary gift. There is a variety of different styles, and thread counts to choose from. The thing to remember is that the higher the thread count is the more expensive and better quality the sheets will be. 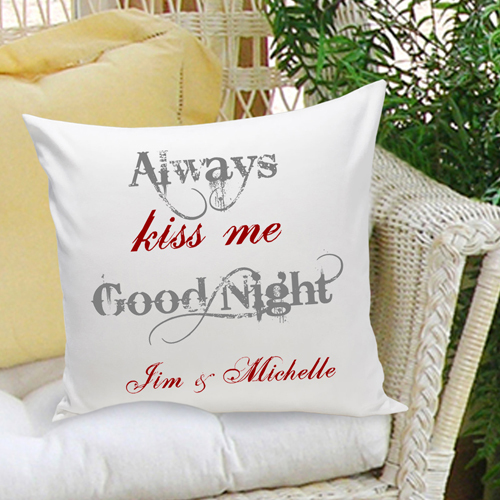 A personalized pillow with a beautiful Love Quote would be a lovely romantic gift for your wife. There are lots of personalized gifts to choose from in our store. 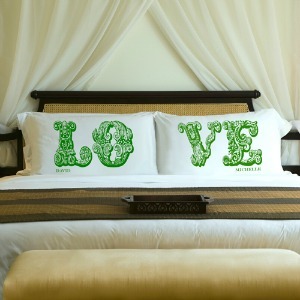 If you were looking to buy a linen gift for a couple then how about these fun personalized pillows. Personalize with your names ... and they Loved happily ever after. Available to buy in our Anniversary Gifts Store. Canvas is a form of linen and this is a lovely reminder of your 8th anniversary. Your favorite photo of the two of you from your wedding would be fun, especially if you haven't got round to printing your photos! 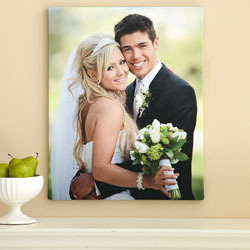 You can find lots of photo canvas ideas at Personal Creations and if you use this link you will also get 15% off too. If you were looking for a more practical linen anniversary gift then how about a lovely handmade linen quilt? You can also use the linen theme to get away to a great hotel, you will want something in the 4-5 star range. These types of hotels provide some of the best bed linens available, of course you can't take them home but you can have a great weekend! Browse All Travelocity Vacation Packages & Save up to $525 on your Flight + Hotel. You can also have a great deal of fun with linen gifts. The second thing that comes to mind when you hear linen is probably going to be paper. High quality paper is usually made out of linen. A great gift would be to get linen bank notes in small denominations, place them in a small case in stacks one bank note on top of each of the stacks with newspaper forming the rest of the stack. It would be just like in the films! Another great linen paper gift is to write a poem or letter, which expresses the way you feel and have it printed on linen paper. This allows you to incorporate a home made gift with the theme of linen. Irish linen is some of the finest linen in the world and makes an excellent gift when it comes to your 8th wedding anniversary gift. 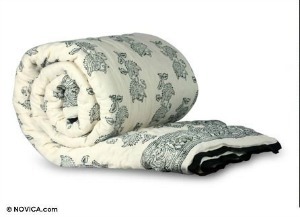 You can order Irish linen online and may be able to find it in some speciality stores. However, if you have ever wanted to visit Ireland, heading to the Emerald Isle to pick out Irish linen straight from the source is one of the all time favorite anniversary presents. We spent 2 weeks a few years ago touring round Ireland from Dublin to Cork and then up the West Coast, we decided to do the whole tour by public transport which was fun and meant we saw lots more. Clothing such as linen suits and shirts make great gifts for wedding anniversaries. They come in a wide variety of colors so they can give you a great deal of versatility. You can also get things like handkerchiefs and other accessories made of linen as a gift. Linen is also traditionally used as support for oil paintings. You can consider an oil painting by a favorite artist or even a brand new one as a gift. Linen is still fairly commonly used despite the introduction of other support mediums. You may have to check with galleries to find ones that use linen, but to be honest I don't think it really matters. In addition, you do not have to limit yourself to what you can find in town. Many galleries and fine art sellers have websites that allow you to purchase paintings online. Worth having a look at Ebay's selection of paintings as a number of new artists will sell their own paintings here.